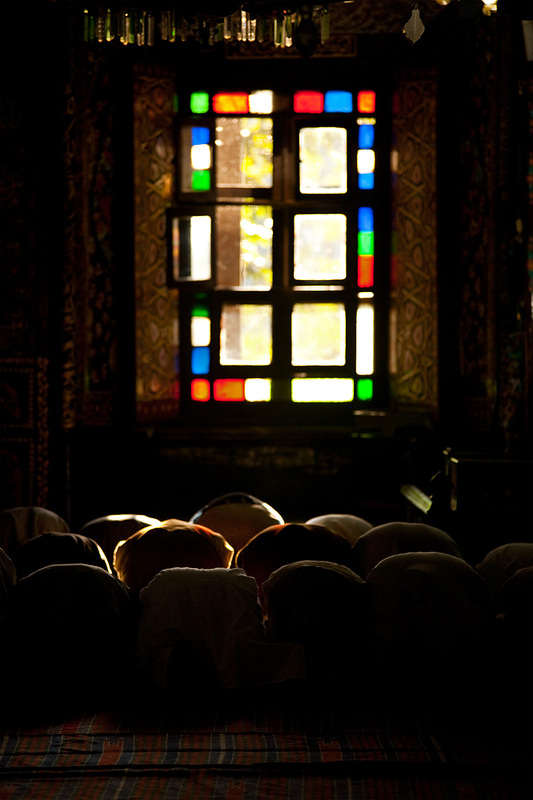 Muslim men bow in prayer inside the ornately decorated Shah-e-Hamdan mosque. Hands down, one of the most unique and beautifully adorned mosques in the world is the Shah-e-Hamdan mosque in Srinagar's old city. The exterior, seen in yesterday's photo, also deserves mention as it's constructed almost entirely out of wood. Non-Muslims are forbidden from entering the prayer hall of this mosque but an official viewing window and a telephoto lens made quick work to overcome that restriction. For those not viewing this photo on www.dailytravelphotos.com, the title will make little sense (e.g. Flickr users). The other two photos published today complement this photo to tell a story about inequality of the sexes. Click http://www.dailytravelphotos.com/archive/2010/04/18/ to view the remaining photos. If you're on the Daily Travel Photos website, you don't need to do anything. 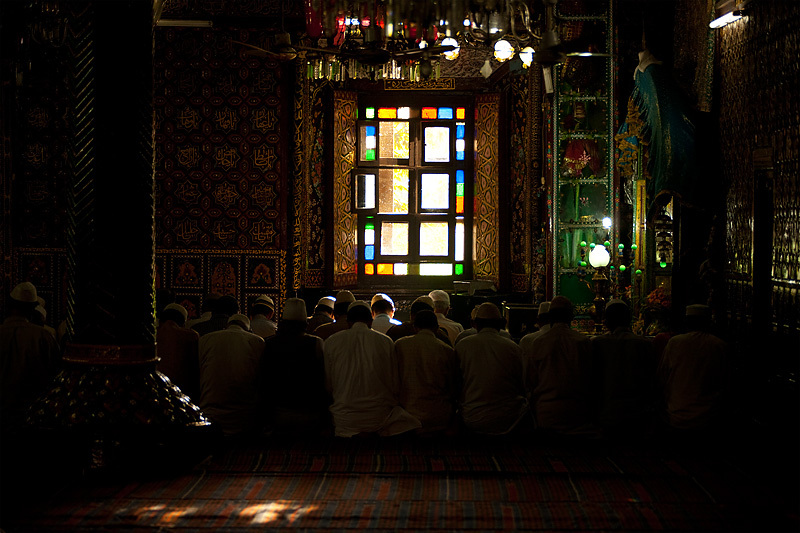 Muslim men kneel in prayer inside the ornately decorated Shah-e-Hamdan mosque. A slightly more expansive view shows off the innards of the prayer hall. It seems every available surface has some type of intricate decoration. Just barely out of the frame are sets of colorful chandeliers. Although gaudy and kitschy on their own, the chandeliers fit perfectly inside this colorful holy room. 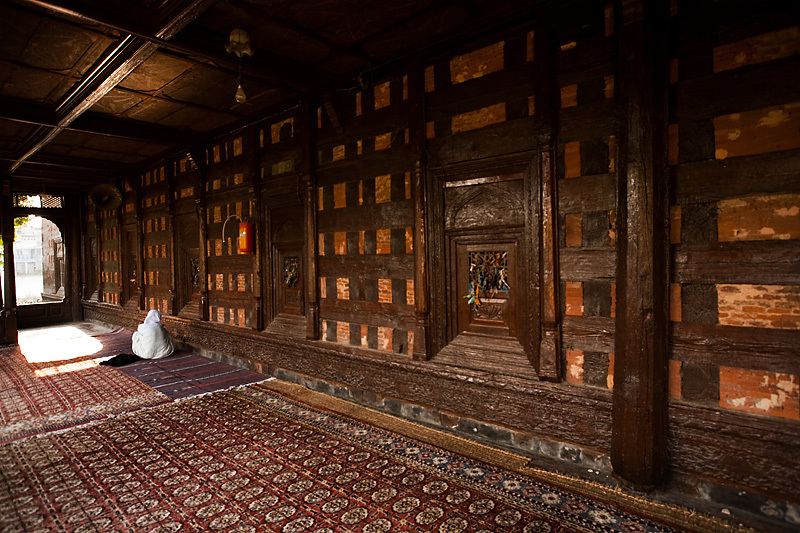 A Muslim woman prays in the partially open side annex of the Shah-e-Hamdan mosque. And as customary in Islam, women are forbidden from praying in front of men. They are to occupy the last row of a mosque, necessarily behind men. As a result, women must overflow into a separate and certainly unequal side annex that resembles a porch. Archived photos (on the weekend) concludes. Stay tuned for more Antwerp photos tomorrow. True, the management should fix things, it's just difficult when this mosque is so historic and perfect in its traditional form right now.